So just thinking out loud...I would like to see your opinions on suggestions for a boat that fits my need. I am looking for a fishing boat. This is what I fish for: bass (largemouth and smallmouth), bluegill, catfish, white bass...I would like to fish for rockfish (stripers) one day. These are the places I would like to fish to pursue the species above: Pickwick, Kentucky Lake, Greer's Ferry, Norfork, other N Arkansas lakes...Will spend the majority of time at Pickwick or 1000 acre lake in the years to come though as retirement looms. Looking for suggestions on what you think would fit the bill. What I think I want is 19-20 ft fiberglass bass boat, 150 HP motor...thinking used Triton, Ranger, Javelin etc. (not sure of brands or age but I would dare say $18K or less...lesser is better). I really like the boat Nyper bought last year or the year before. Not averse to aluminum but think a fiberglass would be more comfortable fish out of and ride in. NO DESIRE TO EVER FISH TOURNAMENTS! Boat will be trailered and a commuter, stored under roof in a shop or barn while in storage. If I were going to buy a fiberglass boat I would have to go with a Phoenix myself. No doubt a glass boat fishes easier and rides better, but aluminum is far less maintenance. There’s nothing wrong with the 3 brands you listed. I wouldn’t go less than 20 feet to fish big water. That wind can turn on you pretty fast on KY Lake. If I were gonna buy a brand new fishing boat this would be it. It is the big brother, current version of my boat. RUGER wrote: If I were gonna buy a brand new fishing boat this would be it. +1. i went from a 90’s model skeeter that i sold years ago to a mod v aluminum hull. i have a pt175 now and i fish KY lake exclusively. from a ride standpoint it is better than the skeeter was probably due to the mod v hull. they build the bracing similar to a glass boat in most aluminum boats now. i can get into some real skinny water with this boat too. the only drawback is the listed people weight capacity at 560lbs. nothing wrong with glass boats either but if you buy a used one you better have it thoroghly checked out. Check out the new Vexus boats! They are starting to explode in the market for an aluminum boat. Don't think they will be in your price range on a new one and doubt there are any used out there this early in the stage. Me personally I like an aluminum, owned a 20' 70" 2015 Xpress that I traded for a tritoon and turned around and found a bargain on a 18/60 Wareagle that was decked out for what I wanted it for!! IF I fished Ky lake or primarily a lake without any submerged structure I would probably go with a glass boat. Even with the Xpress I would not put it in the backwaters at the pump house and some lakes here in Missouri. And fishing alone that boat was almost to much for one person. For what you mention, I vote 18' or 20' aluminum all the way. I have owned them before and now I own a 19' fish and ski. There is a reason catfisherman also have aluminum boats, carpet will ruin in 10 minutes. I'll also add, I would want aluminum if I was storing it out side in a barn. Striper fishing you need to be able to walk around. 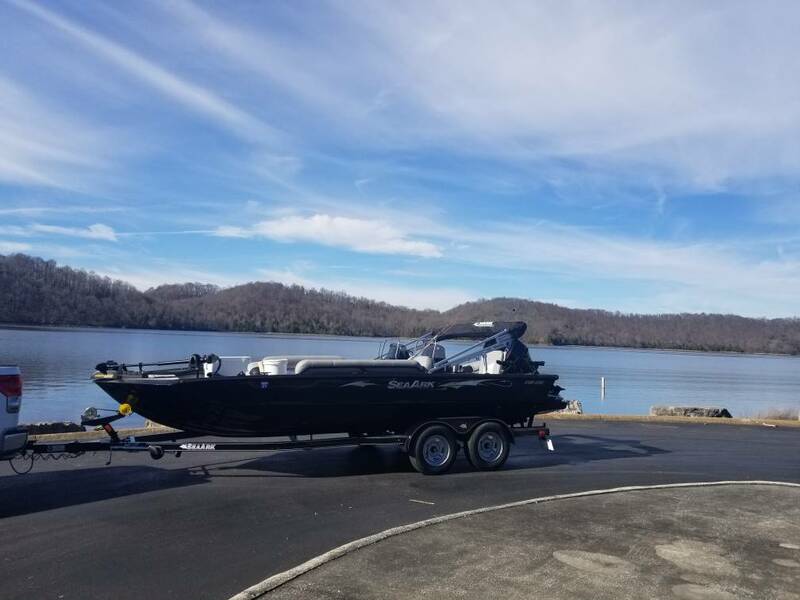 My neighbor up on KY lake has an 1860 triton with a 90 merc 4 stroke and it is sweet and I love it and we go everywhere that my fish and ski will go. I would trade my fish and ski in for one if my kids and family would fit!!! Aluminum boats are lighter, easier to get in and out of smaller places and shallow water. If money was no option, the new Sea Arks are awesome!!! Aluminum cons, rougher ride in choppy water. They also tend to lean meaning you stand on one side and everything in the boat tilts and runs that way. Fiberglass is heavier and sits more stable in the water. IMO, you are not going to find ONE boat that will do everything you listed in your post. Some of it will be much better handled by a small river type of boat, while the rest will do better in something much bigger. You will need to decide what type of fishing you will be doing the most of to make the proper decision. If tournament fishing is not one of your needs, I'd be looking for an aluminum bass type boat in the 18-19' range. You won't find a lot of difference, if any, in the ride. And, most are much lighter than a similar sized fiberglass boat and will perform with a lesser horsepower motor. That will translate to upfront savings in motor cost, and later in gas savings. It will also be lighter to pull, so there will be some gas savings in the towing as well. Ever looked at a SeaArk? The Easy series of boats are just plain awesome, and the ProCat is a fishing dream. X-Tennessean wrote: Check out the new Vexus boats! They are starting to explode in the market for an aluminum boat. The vexus to me is not a boat I would get. Ugly, has to be a rough ride in rough water, that is from a friend who designed boats for a major boat company for many years, have not ridden in one though. And $50,000 is to much for an aluminum boat. if you are ever near south KY lake you can drive my 175 and see what an aluminum boat feels like. I switched from an aluminum bass boat last year to an aluminum center console. I love the versatility of the center console. I have a 20 ft. Lowe Bay Boat with a 150 4 stroke. yeah thats what i thought till i watched it thru but he runs through some white caps at the 3:00 minute mark. id say no more than 10mph though, lol. nothing like up near buchanon when a quick storm rolls in or when you have 3 or 4 tug boats coming in and out of jville at once lol. not to hijack, ive been meaning to ask you, have you ever seen that big cargo ship around jville. ive seen that thing twice in the last 2 years and always in the winter when the water is low. Checkout the crestliners while you are looking. I had never paid any attention to them until one of my buddies bought one a few years ago. After being in his and studying them I bought one in fall of 2017. I believe they are built a little better than some in their class. I looked long and hard at the Crestliners. The 20 ft. center console though does not have a bait well and I don't like having a live well in the front of the boat. It sloshes out too much water into the boat if you are riding in rough water. Know that from experience with my other boat. Also the Crestliners use 0.110 aluminum. The Lowe boats use 0.125 everywhere. Just creates a heavier stronger boat. No,dont think ive saw it.If a man is gonna fish in rough conditions on kylake he needs a fiberglass boat.